This is the simple story of Charlotte (played with effortless ease and considerable verve by Charlotte Gainsbourg), a girl of thirteen or fourteen who is unhappy with her lot. The school holidays are approaching and she is not going away for a month - not until August. She has nothing to do. She hates her peer group, so doesn't hang with them. She hates the fact that no one at home takes her seriously. Her only friend is Lulu (Julie Glenn), a younger girl with a weak disposition, constantly taking medication to keep her out of hospital, and constantly getting under Charlotte's feet. This is the simple story of Charlotte (played with effortless ease and considerable verve by Charlotte Gainsbourg), a girl of thirteen or fourteen who is unhappy with her lot. The school holidays are approaching and she is not going away for a month - not until August. She has nothing to do. She hates her peer group, so doesn't hang with them. She hates the fact that no one at home takes her seriously. Her only friend is Lulu (Julie Glenn), a younger girl with a weak disposition, constantly taking medication to keep her out of hospital, and constantly getting under Charlotte's feet. Charlotte becomes jealous of her brother, who *is* going away on holiday, and Lulu and the housemaid Leone (Bernadette Lafont) bear the brunt of this. There are, however, two new people in Charlotte's life. On one of the last days of school she sees a video of Clara Bauman (Clothilde Baudon), a child prodigy. On the video, Clara is playing Beethoven's Third Piano Concerto. Charlotte finds out that she and Clara are the same age, and that Clara is coming to town to play a concert. It is while watching the video that we see where Charlotte wants to be. We see her inherent understanding of the music and her love for it in the expression on her face. (It is also possible that the love and desire reflected on her face is for the girl.) As the holidays get under way, we see Charlotte out walking with Lulu. A car pulls up behind them and the driver asks if Charlotte knows the way to a place where the other occupant of the car can have her piano stool repaired. The other occupant of the car is none other than Clara Bauman. Charlotte does, indeed, know the way to the metal work factory and shows them the way. Once there, she hangs around and listens carefully to the conversation in an attempt to find out where Clara is staying. She also hears that Jean (Jean-Philippe Ecoffey), a temporary worker at the factory, will deliver the piano stool once it is fixed. Clara and her driver - her manager Sam (Jean-Claude Brialy) - thank Charlotte for showing them the way and depart. But Charlotte has formed her plan: she will hang around and get to know Jean so she can deliver the piano stool with him. In her own clumsy way, Charlotte succeeds in getting to know Jean, and does so seemingly unaware of the dangers of striking up relationships with men ten years her senior. When she gets home, all Charlotte can do is talk about her new pianist friend. This, of course gets on the nerves of Lulu, Leone, and her father - a man who always appears dog-tired. The following day, Charlotte meats up with Jean and they deliver the piano stool to the grand lakeside mansion where Clara is staying. Charlotte manages to get to stay behind once the delivery is made and also succeeds in getting herself invited to a party that night. Once again at home she continues spouting off about her pianist friend, now claiming that she will be joining her on the rest of her tour. In her happiness she sets off a firework in the kitchen, further annoying everyone. As the days to the concert go by, Charlotte becomes increasingly obsessed with Clara. She buys a new dress for the concert. Leone rubbishes the dress, saying it awful and unsuitable, and Charlotte has another of her tantrums. As a result of this she agrees to go to the cinema with Jean. After watching "The Exorcist" they go back to his hotel room. Jean, of course, tries it on with her. She escapes after bashing him over the head with a globe of the world. Meanwhile, because of Charlotte's obsession with Clara, Lulu has become very worried that Charlotte *actually will* leave with her after the concert, so, during the concert, sitting with Charlotte and Leone, Lulu throws a tantrum - right in the middle of the performance - and the trio have to leave the auditorium. Charlotte throws another tantrum and goes to wait backstage for Clara. Clara, however, finishes her performance on a musician's high and completely fails to notice Charlotte. She leaves without her. A distraught Charlotte is seen wandering around outside the concert hall by an overjoyed Lulu, but Lulu's emotions overcome her and she collapses. The final scene is at the hospital where Lulu is recouping. She is on a balcony holding hands with Charlotte, Charlotte finally having realized that what she has got is far better than what she wants. 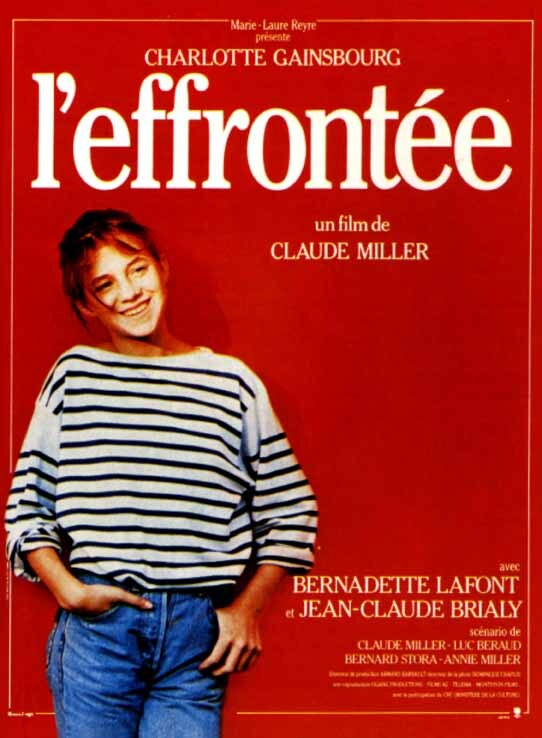 This film very deservedly won several awards: Prix Louis Delluc - Claude Miller, Cesar Awards, France - Best Supporting Acress - Bernadette Lafont, and, of course, Cesar Awards, France - Most Promising Actress - Charlotte Gainsbourg. Go rent it, if only to see where Hollywood so often goes wrong.